*A comprehensive performance assessment to the competent and authorities concerned in following up the implementation of the UNESCO recommendations after the inclusion of the marshes in the World Heritage List, and the identification of the causes of delays that led to Iraq’s failure to implement the initial requirements within the Marshlands file. *The urgent and immediate formation of an independent unified committee, under the direct supervision of the Presidency of the Council of Ministers, to start the implementation of the UNESCO recommendations, and management of the Marshland file to ensure its preservation within the World Heritage List. *To work according to the requirements of the World Heritage Committee in involving local communities and civil society organizations as a key partners in managing the marshlands and ensuring real and effective representation of representatives from civil society in any committee responsible for this issue. *Develop a comprehensive management plan that takes into account the international conditions of the Historical Sites and marshes listed in World Heritage List, and takes into account Iraq’s time limits for the fulfillment of these conditions, including phased timetables to be committed to avoid further delay. *Supporting and encouraging natural and cultural tourism in the marshes and archaeological cities, by assessing the tourism situation of these areas and starting the establishment of the infrastructure that qualify them to be a tourist destinations that benefits their local inhabitants. *Develop policies to ensure food security and sustainable development of the Marshlands population. *Ensure the provision of equitable water proportions to maintain the required levels in order to sustain the natural, environmental and economic life of the marshes by negotiating with the upstream countries of the Tigris and Euphrates Rivers and their tributaries to secure access to Iraq’s water rights in accordance with international norms. *Negotiate with the local governments of the marshlands governorates, in order to reach a common conviction that the marshes on the World Heritage List should be independent within a unified management of all the marshes of different geographical location and administrative divisions. *Develop a vision to market the products of the local population of the marshes, to be a tourist, economic as well as an investment attraction. *Secure the water future of Iraq, and invest every drop of its water imports before going to the downstream, as well as securing the future of the marshes to store water in nearby tanks to maintain equal levels of water in the marshes. *Establish a joint research team to support scientific researches, to find the best ways to treat pollution and maintain and preserve normal life in marshlands. *Enacting strict laws and taking firm measures to reduce the phenomenon of overfishing, encroachment on natural resources and environmental damage, while providing economic alternatives to the local population within the Marshlands Restoration Plan. *Encourage Iraqi universities with scientific and social specialties to guide graduate students to provide more studies that constitute academic sources for the development of the reality of the marshes. *Facilitating investment procedures and open doors to investors to work on the implementation of service, economic and tourism projects in the marshes, and enable the private sector and give it the opportunity to be an active partner in the process of revitalizing the marshlands. *Accelerate the legislation of the Marshlands Law. *Activate the role of the National Reserve and to initiate the establishment of other nature reserves. *Facilitate visa procedures for foreign expatriates wishing to visit and offer international solidarity with the marshlands issue, as well as facilitating the procedures for obtaining security approvals to enter the provinces where the marshes are located within their borders. This process plays a key role in promoting the Iraqi marshlands as a tourist destination locally and internationally. *Take a serious and firm stance in rejecting the continued construction of the Turkish Ilisu Dam without providing any respect to Iraq’s water rights and without reference to the international conventions of the riparian countries. 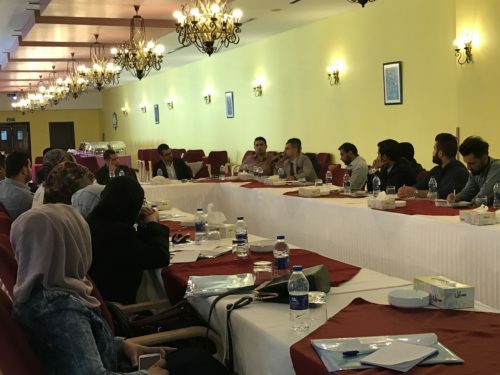 The session concluded to the formation of an Iraqi gathering of civil society organizations, activists and academics interested in the issue of the marshes, under the title of “Our Marshlands” as the first alliance of Iraqi civilian parties interested in the issue of the marshes, to work on the provision of protection, development and integrated management. Those who joined the gathering are: The Iraqi Social Forum, The Development Center for Energy and Water, Humat Dijlah Association, The Association for Human and Environmental Protection, The Iraqi Green Climate Organization, The Iraqi Civil Society Solidarity Initiative, Save the Tigris and Iraqi Marshes Campaign, Bilweekend Cultural Project, Dr. Jabbar Al-Saadi the Iraq representative of the International Federation of Buffalo, Dr. Ibrahim Sudanee, Dr. Durgham Ali, Dr. Maytham Abdullah, and Mr. Sadiq al-Maliki as activists and academics interested in the environment and marshes issues.